This Bright Tangerine Strummer DNA Matte Box Kit with Flags, Donut, and Horizontal Filter Tray is a CFE Kit that has been assembled to provide you with a complete 15mm rod-mounted swing-away matte box kit. The Strummer DNA matte box includes the two-stage cassette as well as a single-stage expander, and there are three filter trays included so you won’t have empty stages. For controlling flare and veiling glare, the kit includes a top flag, often referred to as an eyebrow, and two side flags. The Black Hole Donut provides light leak protection when using lenses with an outer diameter between 62 and 143mm. The Strummer DNA from Bright Tangerine is a reconfigurable matte box that allows you to switch out one filter stage assembly (cassette) for another one with stages of a different size. Whereas traditionally filter stage assemblies are fixed within the matte box, Strummer DNA allows you to swap one out for another in just moments, in effect allowing you to use one matte box to perform the job of multiple ones. When you need 6″ filters, you can simply swap in a 6 x 6″ cassette. 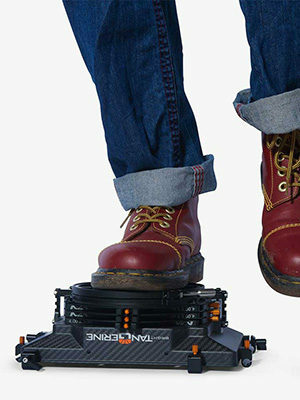 Strummer DNA offers a 143mm diameter when using 5.65″ stages, and 165mm diameter when using 6.6″ stages. 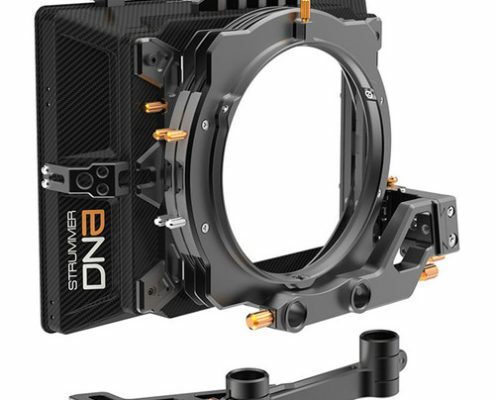 It’ll support 14mm Cooke lenses in 3 PV stages, and will cover a 12mm Master Prime with a 6″ stage. The stages in the cassettes are individually stacked up one on top of another, and you can attach additional, single-stage expansion packs to the stack. At the click of a button, the individual stages are easily separated. One of the benefits of this is that the stages become very easy to clean since each one can be handled separately, whereas normally filter stages are more difficult to clean when they get clogged up. All the stages are rotatable 360° (with the exception of certain cassettes). This Strummer DNA Kit includes a core frame with a carbon fiber shade, 5.65″ 2-stage cassette, 5.65″ single-stage expansion pack, swing away slide bracket and 15mm LWS arm for swing away functionality, top flag mounts, and side 3/8″ mounts. Strummer DNA side flags, sold separately, feature dual variable blades that can be tucked in between top and bottom flags, also sold separately, so that the top and bottom flags can be closed beyond the traditional 90°. Strummer DNA also supports an optional A.R.F. tilt block that enables backward/forward tilt up to 15° to prevent filter reflections. Bright Tangerine’s 143mm Black Hole Donut works with lenses with a front outer diameter between 62 and 143mm. 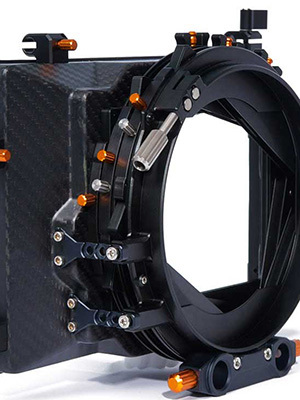 It is compatible with Bright Tangerine Viv, Viv 5″, Misfit, and Strummer DNA matte boxes as well as select ARRI matte boxes. The black elasto polymer stretches to fit on your lens, and features a conical shape that allows for two inches of lens travel. The Black Hole Donut is fitted with a 138mm filter ring and threaded retaining ring. This allows you to mount your 138mm filters into the front of the donut, which is then attached to the front of your matte box. The Black Hole Donut expands to fit lenses with diameters between 62 and 143mm. With two inches of travel, you can use this lens donut with lenses that change size as you change focus. Add extra flare control to your matte box with this Bright Tangerine Top Flag. The carbon fiber design is lightweight and matches the aesthetic of Bright Tangerine matte boxes. Use the integrated quick release attachment system for mounting on your Strummer DNA matte box. Integrated variable side wings expand from the sides of the top flag for additional light blocking. Knurled knobs allow you to set the exact position of the side wing and lock it in place. The top flag can also be used as a bottom flag for controlling glare from below your camera. This is a pair of carbon fiber Bright Tangerine Side Flags for the Bright Tangerine Strummer DNA matte box. Each flag features dual variable side wings and flag mounts. This is a 4×5.65″ horizontal Bright Tangerine Filter Tray for the Bright Tangerine Strummer DNA matte box. 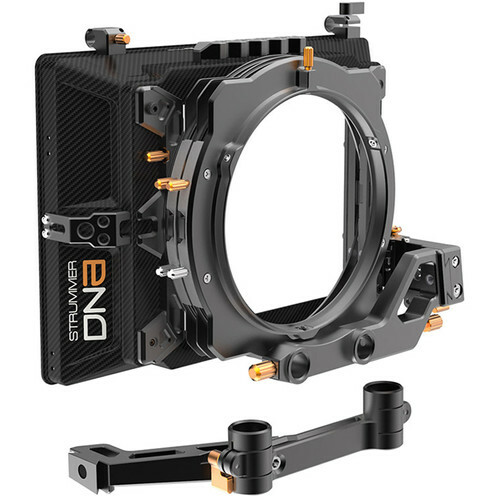 The Strummer DNA matte box, not included, can accept 6×6″ and 4×5.65″ filter trays with optional filter cassettes. This filter tray allows you to use a 4×5.6″ filter, and it features solid baffles to block the light from sneaking around the filter.